If Kat’s dream about her hand was real, is the secret passage next to the fireplace in her room real? I love the book! Your book moved to FIRST place! I am thankful that you wrote this book and my mom is now reading it because I thought it was GREAT. Thank you SO much for loving my book and for sharing it with your mom. I hope she likes it, too. Yes, the secret passages are all real. If you ever visit a castle in Scotland or England, you may find hidden passages are quite common. Usually they were used for the maids to get around quickly. Or sometimes they were used to hide in times of danger. But in Rookskill, I believe there are many more passages there than the norm. Somewhere in the castle’s history, someone needed many hidden passages. Maybe I should write about that – what do you think? Our heroine is so clever. She knows her hand is from the magister. Why doesn’t she make the connection between the Lady and magister? My daughter and I both love your book. Thank you for your work! Thanks so much for your note! I am working on a sequel, and hoping that my publisher will say yes soon. That’s a great question about Kat and the magister. Of course, when he “fixes” her hand, she’s not really consciously aware, and forgets the incident soon after (that’s part of the spell). So I imagine that she can’t make the connection because the magister is not really on her mind. However…since you asked about a sequel…I will be bringing the magister back and Kat will definitely come to know him. And I won’t spoil the fun for you. Thanks so much again and so happy you both love the book! My first question, about the relationship between Peter and Kat in THE CHARMED CHILDREN OF ROOKSKILL CASTLE. -Thanks for taking the time to read this! I love the book. I read all the time so sometimes I can be picky about the books I read, but this one is amazing!! I love how you manage to combine WORLD WAR 2 with black magic. And I like how a group of kids come together to defeat the enemy, I just love teamwork! I like how the end leaves you expecting another adventure. I’m trying to get my family to read this book! Thank you so much for you thoughts – I’m so happy you liked the book so much! 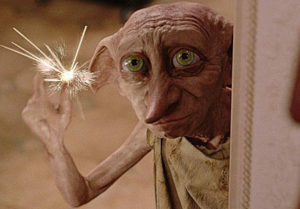 I loved combining the war with the magic, too. Peter really likes Kat, and will always be her friend. And if there’s another book (I’m hoping), they will become even better friends. But Kat does have flaws, and I think it’s an important part of friendship to learn how to accept others despite their flaws. I think there will be more about that in their future. I’m betting there are lots of adventures ahead for the two of them together. I hope this answers your question, and that everyone in your family enjoys the book, too! 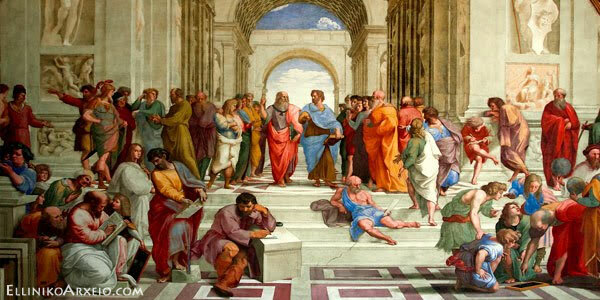 Plato founded his famous Academy in an Athens grove in 387 BC in order to informally tutor those intellectuals who wished to discuss philosophy and the sciences. Socrates was his mentor, having conducted his own school (the Lyceum) before being put to death after charges of corrupting the youth of Athens. Plato continued Socrates’ tradition of oral argument and debate; Plato’s most famous student was Aristotle. 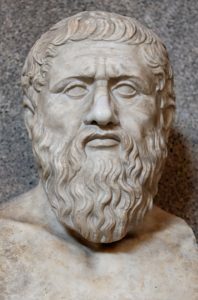 Plato wrote his treatise, The Republic, as a way to elucidate societal behavior and in particular the notion of justice. Our democratic ideals descend from Plato’s arguments. 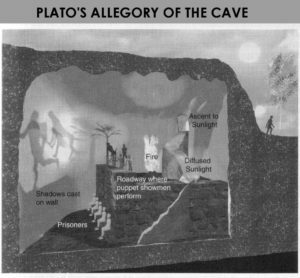 One of his most famous arguments in favor of thoughtful pursuit of knowledge is the allegory of the cave. Plato argues that the world is divided into two realms: the visible, and the intelligible (which we can only grasp in our minds). In the allegory of the cave, he suggests that people are like prisoners chained from birth in a cave and unable to turn their heads. They can only see the wall of the cave before them, and behind them is a wall along which puppeteers can walk. A fire casts shadows of the puppets on the cave wall. Those prisoners in the cave believe that the shadows are reality. When they are freed from their chains by education they discover they’ve been seeing only shadows of copies of reality, and not reality itself. Plato questions the notion of reality in this allegory. 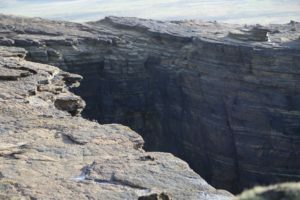 Even more importantly, he suggests that those who can leave the cave – see the full scale of reality through the gift of education – must take this knowledge back to those who haven’t yet left the cave. Knowledge should be the goal of all of us, through education and realization. I really believe that knowledge and education are the foundations of a rich, full life. Plato’s allegory works for me, just as it does for my character, Kat. 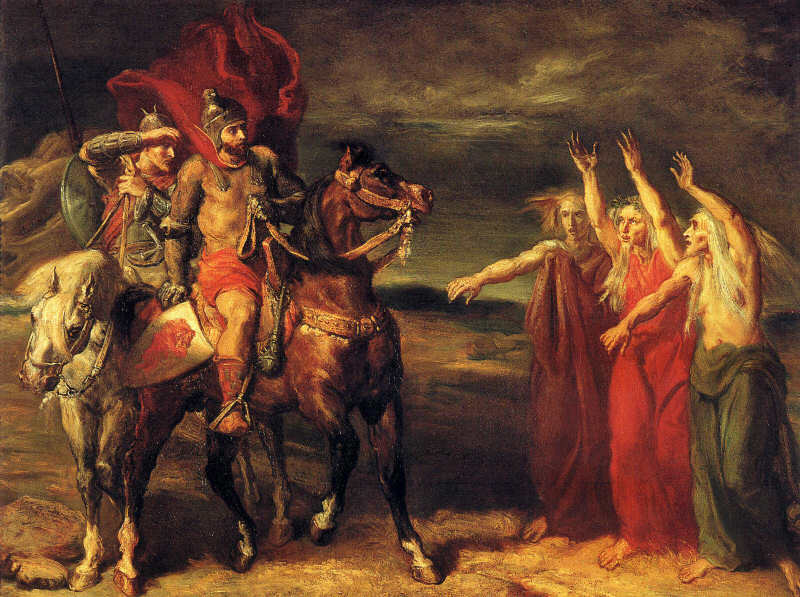 Macbeth is a Scots general who receives the prediction that he will one day become king of Scotland. He’s set upon his deadly path by three witches who can foretell the future but who also use their power to play with human emotions. 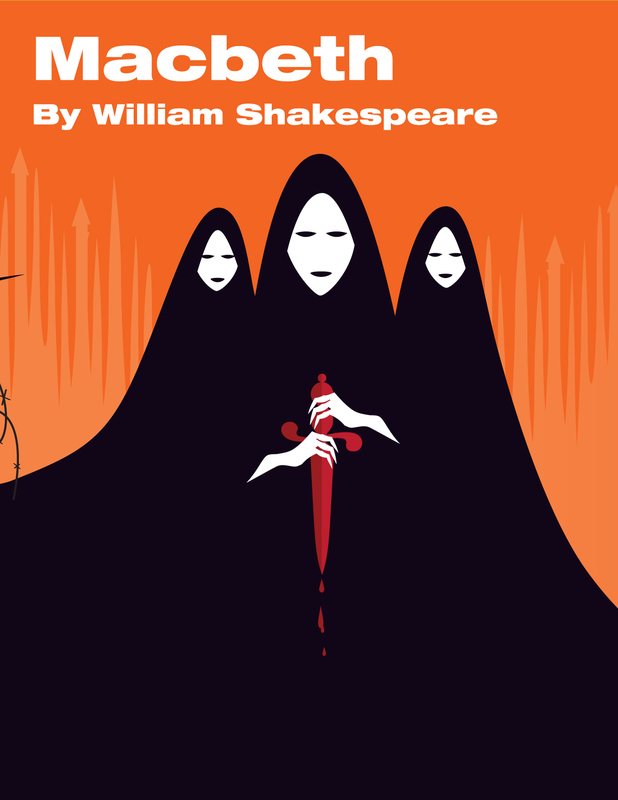 His ambition drives him to commit acts of murder, first of the current king, and then of many followers and allies and presumptive heirs and their children, including his compatriot Banquo, until Macbeth himself is undone. 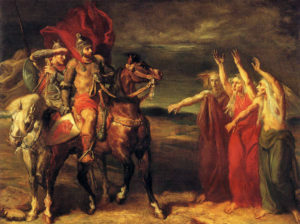 Macbeth is goaded to action by his wife, who will stop at nothing to see her husband become and remain king, her ambitions initially outstripping his. 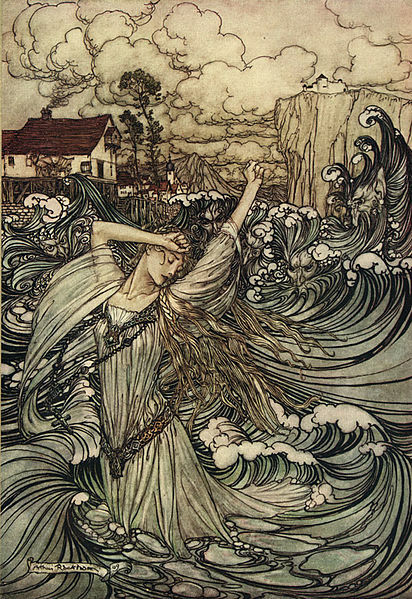 But as the story unfolds the Lady is torn by guilt and driven toward madness – sleepwalking and obsessively washing the blood from her hands – until she finally commits suicide. Macbeth has always been one of my favorite Shakespeare plays. 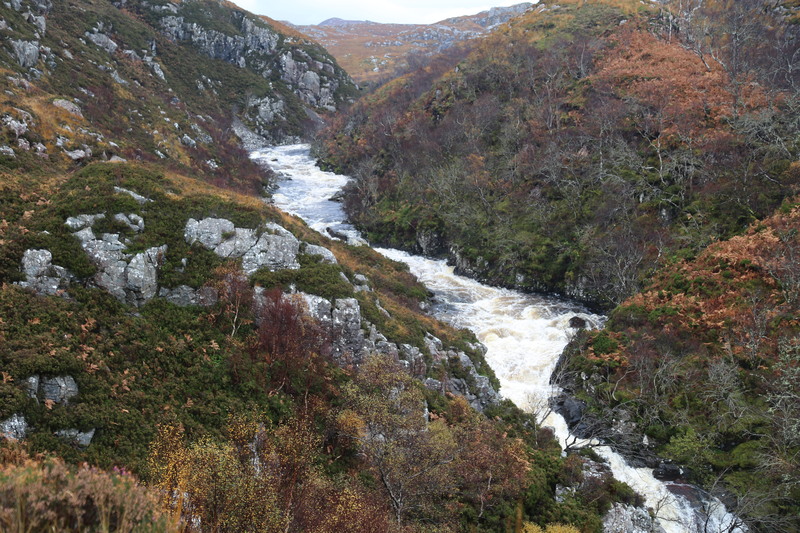 It’s a creepy horror tale set in Scotland and rich with magic and mystery. 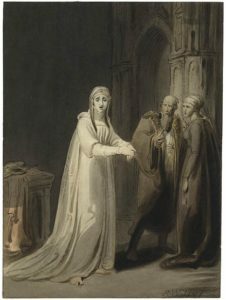 Shakespeare uses phrases that echo nursery rhymes or fairy tales, reminding the audience that behind the story is longing for a child and heir: “Open locks, whoever knocks”; “The Thane of Fife had a wife”. There’s little doubt that Macbeth and his Lady love one another, maybe too well. As I drafted The Charmed Children, I struggled with my “tragic figure”. She’s an antagonist, yes, but she must also be multilayered and multifaceted, not flat. I had to give her a backstory that would make her at least understandable, if not sympathetic. It is, in part, her longing for a child that drives her terrible behavior. Thus the comparison with Lady Macbeth is such an honor, for Lady Macbeth is a character who inspires compassion even while her actions are horrific. I didn’t use many Scots dialect words in The Charmed Children of Rookskill Castle. Using dialect is tricky. Too much and people get turned off. Too little and the story doesn’t sound authentic. Words I did choose to use include ken (to know), bairn (child), and laird (landowner). 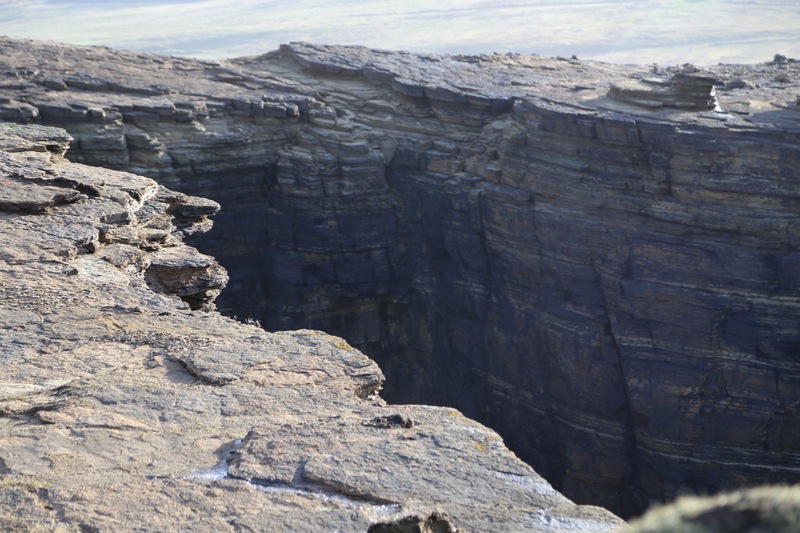 When I named the castle Rookskill, it was to suggest death (with the word kill), but also because in Scotland a kill is a kiln-shaped chasm in the rocks, linked to the sea by a tunnel, and Rookskill is near the sea. Rooks are birds of the crow family. 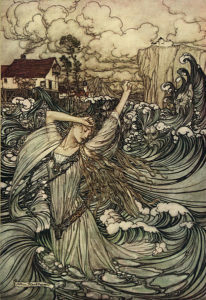 But you wouldn’t want to run into a bogle (a specter) or a kelpie (water demon). Scotland is characterized by many fast-running streams and so has many words for running water: burn (stream), cleugh (a gorge that is the course of a stream), glen (a hollow traversed by a stream), grain (tributary), pow (slow-moving stream), stank (pond), syke (small stream)…I could go on. The castle loomed out of the fog at the end of the winding lane, after what seemed an age. Kat sat up straight, and Peter let out a low whistle. It was much bigger than the picture had made it seem, a real castle with many turrets rising up through the gloom bit by bit, and it did look the sort of place that would house ghosts. 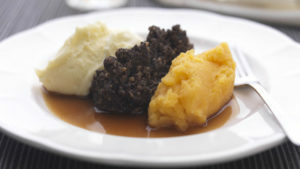 And third, Scotland is rich with magical history, from old tales to Celtic traditions to folkloric animals. Here are just a few of the latter. Selkies are human-to-seal-and-back-again creatures. Most selkie stories are tragic love stories in which one of the lovers turns into a seal and must return to the sea, and cannot reunite with its human companion for seven years. 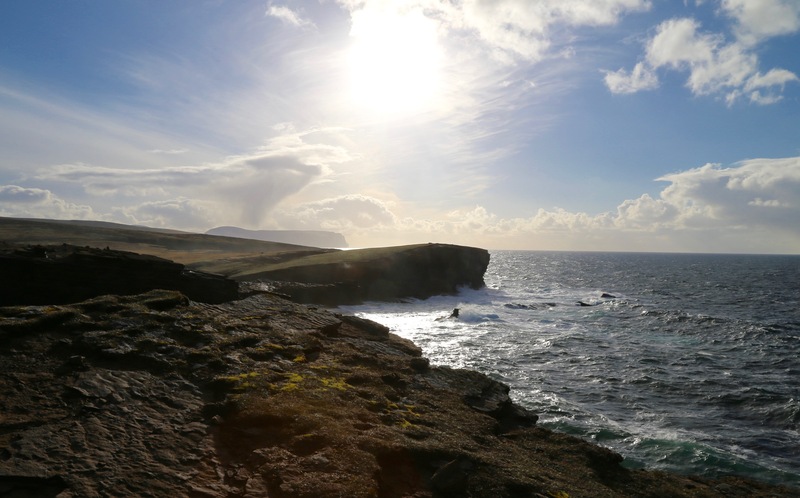 In some tales a fisherman falls in love with a selkie only to lose her. The proximity of ocean to most of Scotland accounts for this and the many other magical creatures (waterhorses and sea monsters) attached in some way to the sea. Changelings are creatures left in the place of a human infant. Usually elves or fairies were the culprits, taking the infant from her crib and replacing her with an ill or disabled child, or a disguised fairy child. A changeling child was often used as a way to explain sudden disease or developmental disability, with the result that the changeling could be left to die without guilt, and the assumption was that the real baby was living with the fairies. 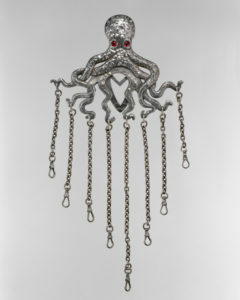 Sometimes a charm – such as an open pair of scissors left by the crib – was used to ward off the child-thieves. Brownies are tiny creatures wearing brown clothing and looking like a little old man covered in curly brown hair. Brownies were usually helpful household creatures, working at night in secret in exchange for gifts of food, and living in attics or walls. Manor houses often kept a chair by the fire for use only by the brownie. It’s pretty certain that J.K. Rowling used the brownie myth as the basis for her “house elves” in Harry Potter. Being familiar with the rich heritage of myths, fairy tales, and magical creatures that defines the world’s cultures is a sure way to add depth to stories set in those cultures. Since I’m of English-Scots-Irish descent, I felt like I was tapping into my roots when I visited the U.K. and borrowed some of its mysteries for The Charmed Children of Rookskill Castle. I spy a whistle, a tiny purse, a thimble, and…? The original title of the novel was Chatelaine. 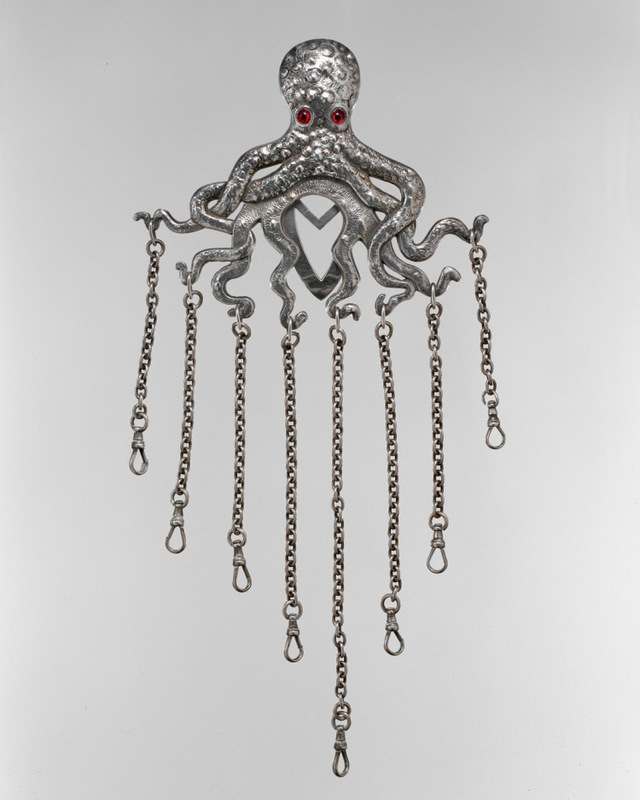 You may be reacting to that title the way that the Viking Children’s marketing department reacted: What in the world is a chatelaine? Because they feared that young readers would have no clue, we changed the title. 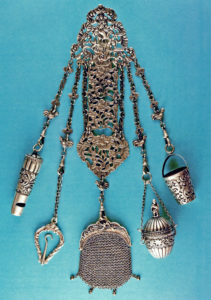 The chatelaine had been a gift to Margaret from her mother upon Margaret’s marriage, and Kat knew it to be a precious family heirloom. 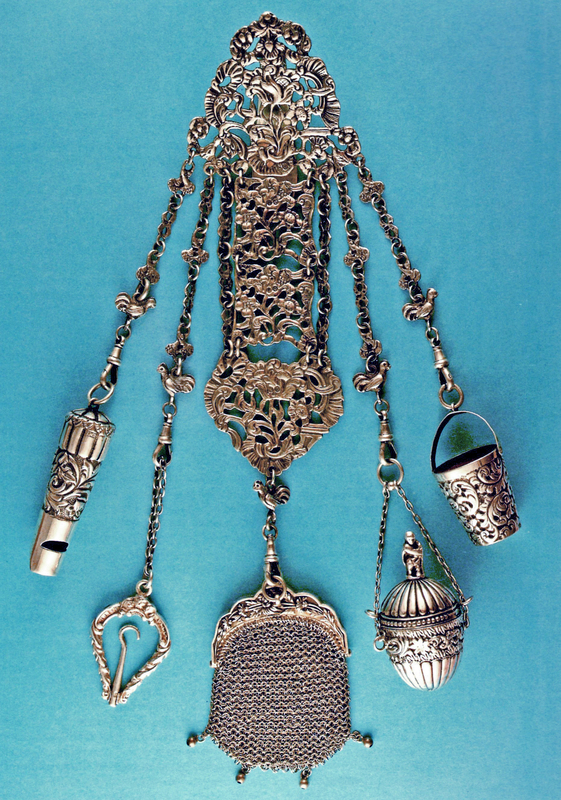 Wrought of silver and marked with the smith’s stamp, the chatelaine contained three useful items that hung from slender silver chains joined on a silver hoop. Originally the chatelaine (the word is linked to the French word “chateau” or castle) was the actual person who held the keys to the castle. The word evolved to mean the keys themselves worn in a cluster, and then to mean something like a charm bracelet worn at the waist. 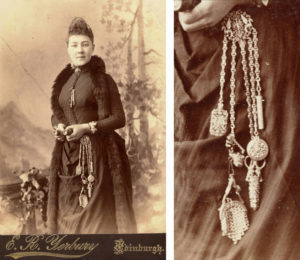 Mrs. Hughes and her chatelaine. 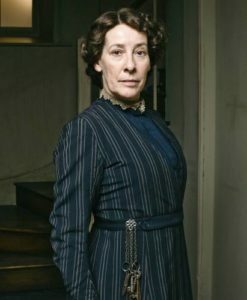 If you’ve watched Downtown Abbey, you’ve seen the chatelaine worn by Mrs. Hughes, which is a set of keys and other items. During the eighteenth century some chatelaines became so elaborate they were almost clownish. The fad faded away in the early twentieth century as fashion changed and became simpler (check out my post on fashion in the early twentieth century for more). Some chatelaines were much like a Swiss Army knife of practical objects. Some were strictly ornamental. Many are quite beautiful. You can think of them as physical “apps”. 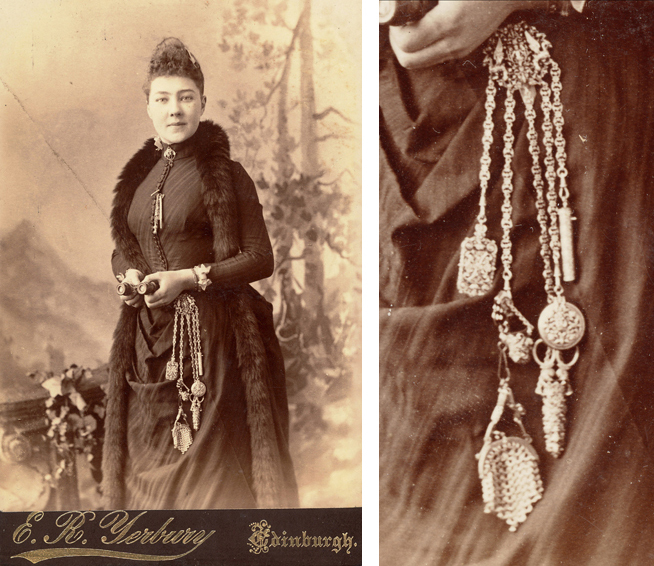 What do you think – is it time to revive this fashion statement? Her hands had trembled a little as she started, but after she’d disassembled the first layer of the works she grew bolder, and her father watched her, interjecting only a little. She’d cleaned and oiled the parts, and reassembled them, tightened the screws and adjusted the balance, and then set the clock to running. It gave a satisfying tick-tick. Kat’s skill with clocks is a crucial element in the story. Mechanical clocks may be an anachronism in the age of streaming time and digital watches, but they are also satisfying – and are resonant with meaning. Time travels in one direction. Time waits for no one. Time can be your friend, or your enemy. When you open up the back of a mechanical clock, you’ll see a beautiful assemblage of wheels and gears all working synchronously. Mechanical clocks need mending, but they can work for centuries (unlike most things digital). 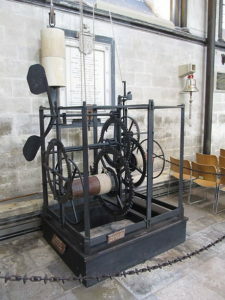 In fact, the oldest mechanical clock is in Salisbury Cathedral in England. You can even make a mechanical clock yourself! I love clocks. 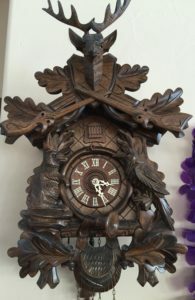 Our family has made a collection of clocks over many years, some inherited and some we’ve picked up along the way. All are mechanical, some chime, some just tick – and one, in my office, is a cuckoo clock, which can drive our guests crazy. 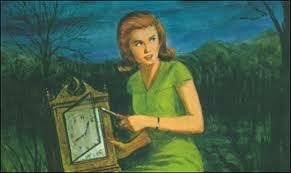 One of my favorite books as a kid was Nancy Drew and the Secret of the Old Clock. I wonder now if it had a subconscious influence on my work. As a writer, I love playing with the concept of time, and what better way to suggest this than to use clocks in The Charmed Children of Rookskill Castle both physically and metaphorically? During World War 2, clandestine stations broadcast news from the Allies into Nazi-controlled Europe, and those stations could be accessed through short-wave radios which access transmissions by way of skip (off the Earth’s ionosphere) propagation. Long-distance communication using shortwave frequencies is often the recourse of governments or individuals seeking to transmit to foreign nations because it’s difficult to censor. 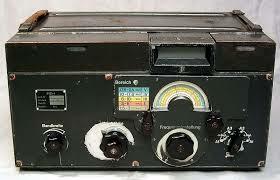 I imagined what might happen if a short-wave radio was part of a spy’s tool kit in Rookskill Castle. Another physical war-related item that appears in The Charmed Children of Rookskill Castle is an enigma machine. Some models look a bit like a weird typewriter. They use rotors attached to the letters of the alphabet in several combinations in order to form encrypted information that can be transmitted. Enigma codes used mathematical cyphers as a product of permutations which made them especially hard to decode. 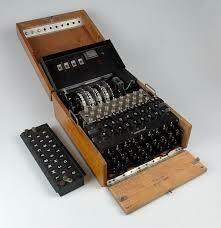 The Germans used enigma machines with great success until code breakers were able to find the correct cyphers. 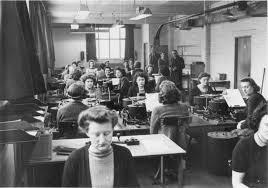 One of my inspirations for Kat was the number of young women who worked at the UK Government Code and Cypher School at Bletchley Park. You may be familiar with the work of Alan Turing through the movie The Imitation Game, but some 80% of the personnel who spent time deciphering code were women. They were not permitted to discuss the nature of their work, even after the war, yet without them the enigma codes would not have been broken. The British were constantly monitoring the coastlines during the war, concerned that a German submarine, or U-boat, would allow for a landing and invasion, even if by a small company of spies. 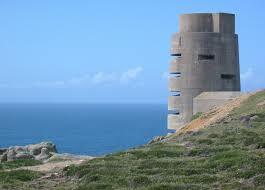 Abandoned fortifications remain along the coasts today. I had a great deal of fun weaving these war-related details into the spooky mystery around Rookskill Castle. In my next post, I’ll talk about how clocks play a role in the story.